Lately it seems as if Sweetie and I are competing to see who is getting older faster. 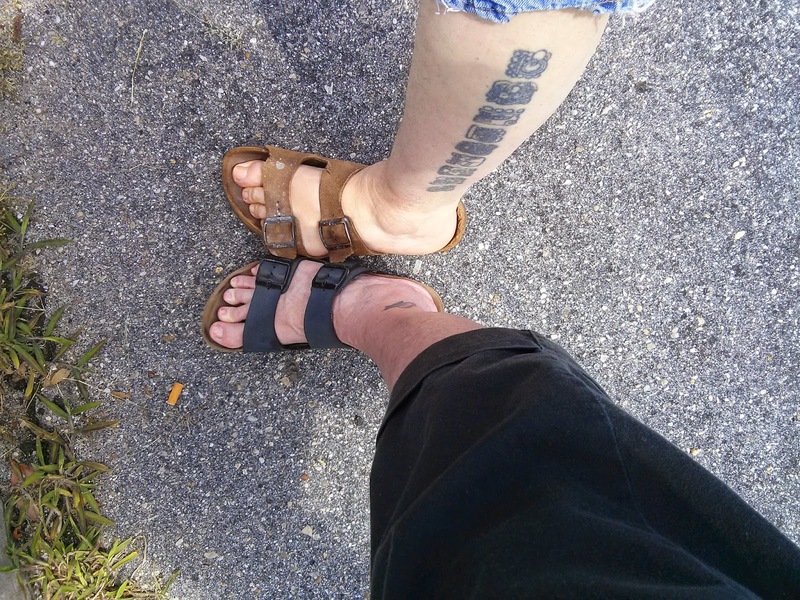 It's not a conscious race, yet both of us have run up against some aging roadblocks. Memory loss and back pain being the biggest bugaboos. Trying to get to the bottom of both these conditions has forced us to accompany each other from one doctor to another. In every office it is the same … check in, wait, fill out paperwork, wait, get on the scale, wait, have your blood pressure taken, and wait until the doc du jour walks in with a fake smile and sits down facing his computer, not you. A few months ago Sweetie came to me with deep concern and mounting fears that his memory loss was more than just forgetting where he put his keys or glasses. 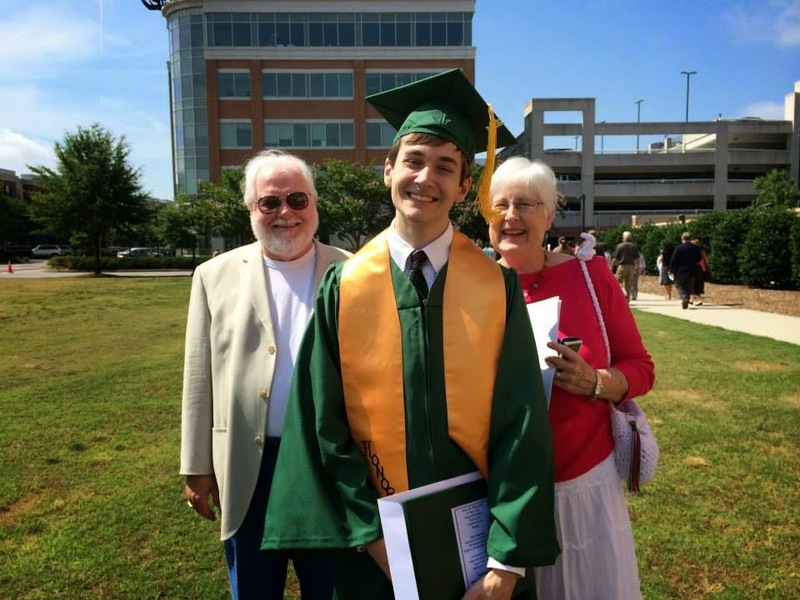 He'd read the symptoms of dementia online, and deduced that he had all of them. There are times in a relationship when you can laugh at your partner's hypochondria, (it takes one to know one) but this was not one of those times. I jumped on board and agreed he needed to see someone who could diagnose his condition from the benefit of experience and school, not the computer. To his credit, Sweetie's primary care doc, took a few notes, then sat squarely in front of his patient and laid out a plan. To begin with he explained that every one of Sweetie's symptoms could be attributed to sleep apnea and for that there is an easy fix. Well, easy for the person who doesn't have to sleep with a CPap machine. Still, a CPap is better than booking a room in the local assisted living home. The next step was to see a neurologist. I'm grateful that this man not only asked the questions, he listened to the answers. Before running Sweetie through a quick assessment he reiterated the fact that sleep apnea could be the memory stealing culprit. Then he asked Sweetie things like What's the date? Where do you live? Repeat these words - house, flag, dog. Draw a line to the left of this circle, and so on. Near the end of his questions he asked Sweetie to repeat the three words. Damn, if the man who feared he was losing his mental capacities did score 30 out of 30. While I, on the other hand, began to squirm in my seat, because I didn't even know the date. Crap, maybe I have dementia too. Then what? From there Sweetie went to a lab run by Dracula and had an MRI. He had an appointment with a psychologist to whom he repeated the whole story. He is still waiting for a second psychological evaluation, a PET scan and a final visit with the neurologist who will hopefully tell us that Sweetie's memory loss is the kind that all of us experience as we get older and to run, not walk to the sleep doctor. A CPap machine may not be a magic cure, but it could be the next best thing. I noticed a few things as we traveled this road of doctor's visits. 1) With each appointment I could see Sweetie relax some. He'd laid aside some of the stressors in his life, which helped a bunch. I think turning over some of the worrying to me helped, as well as being proactive in his own treatment. 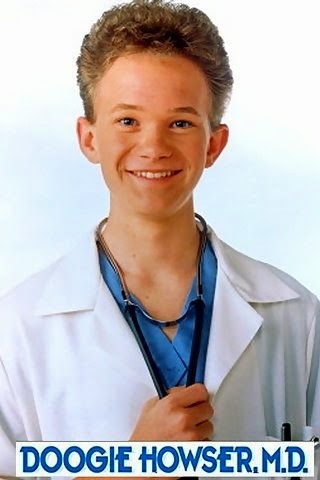 2) All the specialists out there resemble Doogie Howser. Seriously, these kids look like they still have a curfew at night and need permission to use the family car. How is it they have not only graduated from college and med school, they have their names painted on their office doors in gold letters? 3) When I am the patient, my usually calm demeanor can turn on a dime. I don't vent til I get home, then lay all the pent up angst on Sweetie while I stuff cupcakes in my mouth. However, when Sweetie is the patient, I remain clear headed and empathetic. Last week after Sweetie complained about the young doctor he'd just seen, I pointed out that perhaps young doctors are better because they are freshly out of school and had all the latest training. "You're an insufferable …." Sweetie said. "Yikes" I thought to myself, this isn't going so well when he finished up the statement "…. do gooder." Sweetie probably still wanted an opionion from Marcus Welby but at least he was smiling. Sometimes being insufferable isn't a bad thing. I admit, when Sweetie started worrying about memory loss, I became hyper vigilant about remembering things. Let me just say, short term memory is not my strong suit. But I have had other things to worry about. My back has hurt for over a year. What started out as a mild ache, turned into some major pains over time. My doc ordered X-rays which told him, "you have a little rust" in my bones. What? I'm some kind of old Chevy that needs to pay a visit to Macco? Apparently rust is not uncommon in the back, hips, elbows, shoulders and knees of people "my age." I'd take a prescribed dose of prednisone, the inflammation in my back would go away and I'd experience some glorious pain-free* moments. But the pain always came back. Each time with a bit more vengence. So I went to see an orthopedic doc in May. He prescribed physical therapy to "strengthen my core." He said, along with learning not to bend over, but bend with my knees to pick up babies, I should keep the pain at bay, but the "rust" probably wasn't going away. I did everything the therapists told me to do. I stretched morning and night which really did help. I'll never have abs of steel but I could feel my stomach muscles coming around. Then I'd have a set back. Walking too far with Bella or sitting too long while sewing or traveling had me stooped over like the witch carrying an apple to Snow White. This would led to more prednisone and more stretching. About the time I was ready to be released from therapy something happened. Nobody knows what, maybe the way I sat, or stood, or slept or stretched. Pain shot through my back, across my hip and down my leg. I opted for an MRI and an epidural injection. Let's hear it for epidural injections. The pain subsided almost immediately. Woohoo! 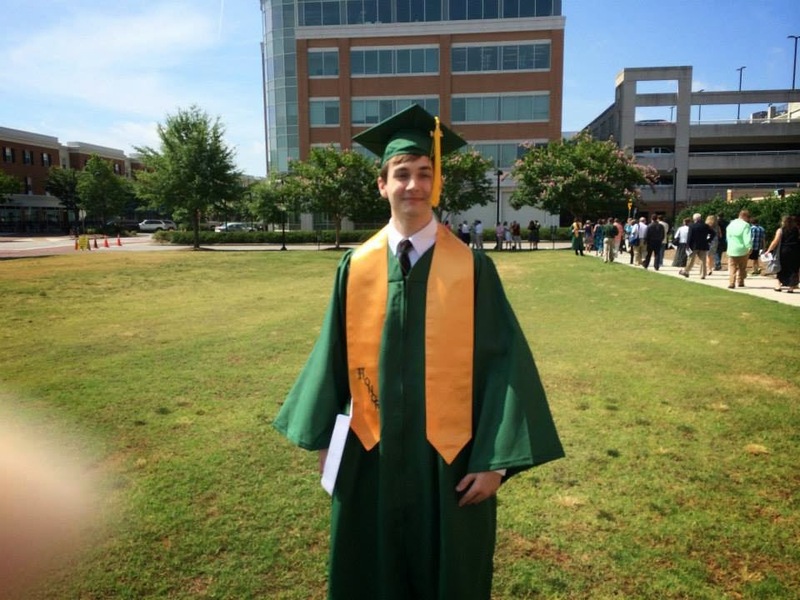 While at Robert's graduation I noticed that I walked funny, with a limp. I also stumbled into things and couldn't feel my big toe. When I pointed this out to the therapist, he looked alarmed. Something was definitely not right. Long story short, a second MRI showed I have a herniated disc, which after much consultation requires surgery to fix. Which brings me to tomorrow. My surgeon, Dougie Howzer's younger brother, assures me he knows what he's doing. I couldn't help but notice how steady his hands are. But then they probably get that way from playing computer games and texting his mother. I've taken good health for granted. Making the rounds of doctors is time consuming, confusing, and expensive. We have decent health insurance yet we are still feeling the pinch of co-pays and prescriptions. Chronic pain (of which I'm sure mine ranks low on the scale) is exhausting. I am lucky to have someone who fusses at me for bending over when I shouldn't, catches me when I stumble, and make lists so neither of us forgets where we have to be when. Some people have to grow old alone. Being an insufferable "do gooder" is a lot better than being insufferable which can be a sure sign that one is not aging gracefully. At the end of May when my writing group, Le Chat Noir Writers Circle, broke for summer vacation, our leader gave us an assignment. She had us make a list of things we'd like to do or have happen over the summer. From there she had us revise the list to include sensory details. For example, one of the things on my list was "take Gracie to the beach," which could be dressed up by saying, I want to "feel the sand between my toes as Gracie and I walk into the shallow waves." Instead of just "reading a book I can't put down" I wrote I want to lose myself in the words, the time and place of the story." Rather than say, "I want to float in the pool." I wrote, I want to let the cool water caress my body on a hot afternoon, or I want to be lost in the womblike silence under the water. When we meet again in September, we are to bring our lists report back to the group how many of the things we actually did. The theory being that by naming a desire we give it power. I'm embarrassed to say that we are nearing the end of July and I haven't done any of the items on my list. In her latest book, Magical Journey - An Apprenticeship in Contentment, Katrina Kenison* writes about the death of a very good friend, facing the emptiness of her nest as her two sons move away, growing older and moving into another relationship stage with her husband. 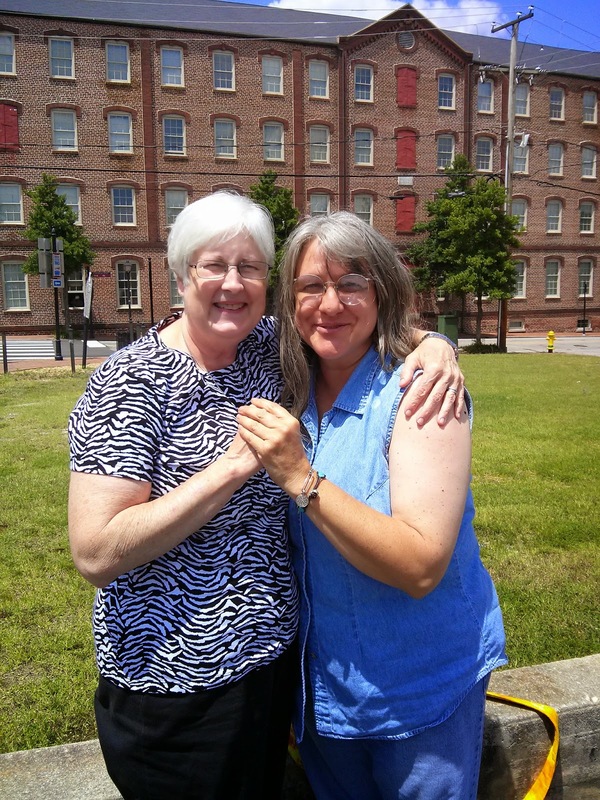 As she spent time by the bed of her dying friend, Kennison wrote that "watching Marie struggle to accept how much she was losing, I began to appreciate all that I had." This observation led Kennison to "capture what was and to transform the past into something alive in the present" in her writing. "I was finally taking time in the day to stop and pay attention to the small moments, the smells and sounds and textures of my own life. I couldn't halt the flow of time, but I could remind myself to appreciate our days together by paying closer attention and by putting words to details I might have brushed right past before." As in Kennison's previous books, Gift of an Ordinary Day A Mother's Memoir, and Mitten Strings for God the author tells how she (re)discovers the sacred, joy and beauty in the midst of her hectic days as mother, wife, and author. She talks of slowing down and "being present." This is what I wanted to do when my daughter, son in law, granddaughter, granddaughter's boyfriend, great-granddaughter, and even my X-husband came to town. I wanted to pay closer attention and embrace the joy. I don't have these people around very often, so I wanted to take every moment and turn it into a memory. Thinking about it, I realized I didn't really know how to be in the moment. Seems like I'm either looking behind, or rushing forward. It's been awhile since Weneki and I had spent any time together. 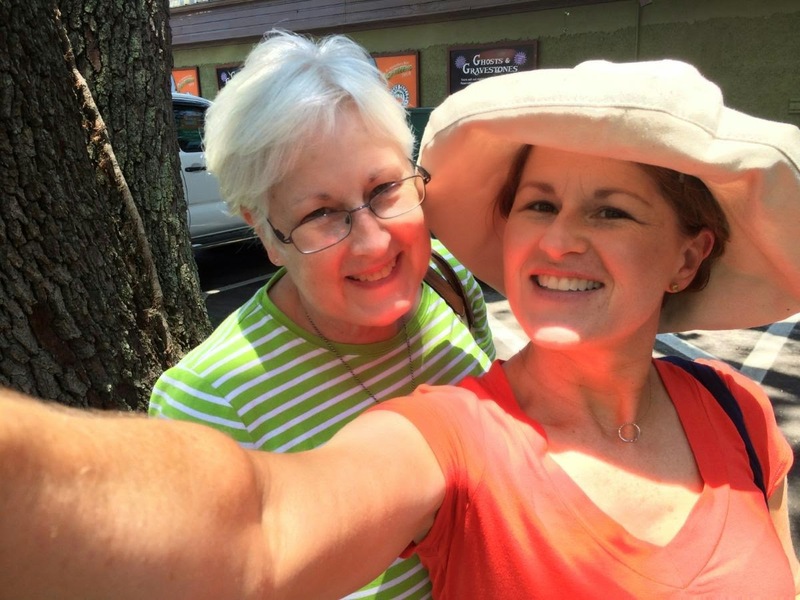 When planning her trip, Mom/daughter time was near the top of both our lists. While I looked forward to getting to know my new son-in-law, and play with Gracie, mostly I just want to be with Weneki and soak up the essence of her. When you live 3000 miles away from your very busy daughter, you miss out on a lot. As with Robert,(see previous posts) I can tell you lots of stories of when Weneki was a child, a teen, a college student, a wife, a widow. But I would be hard pressed to tell you about the woman she is now. I can list her accomplishments, but I don't know her newest goals and dreams. To spend a whole day with her was a magical journey, indeed. I introduced her to a 1905 Salad from the Columbia house, made right at our table. I ate bread slathered in real butter, while she stuck to her no-carb diet. Like the food, time seemed to disappear. When it looked like our waitress wanted us to move along we decided to walk off the calories we'd consumed. We had plenty of time on the imaginary meter cause apparently we paid for free parking. 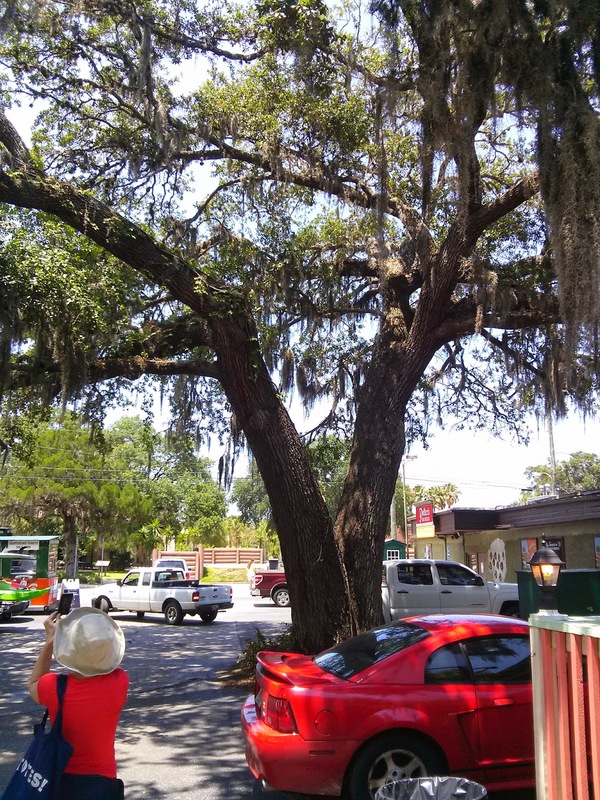 Following a tourist map through the streets of old St. Augustine, in the ungodly mid-day heat, looking for a tree couldn't be too hard, could it? 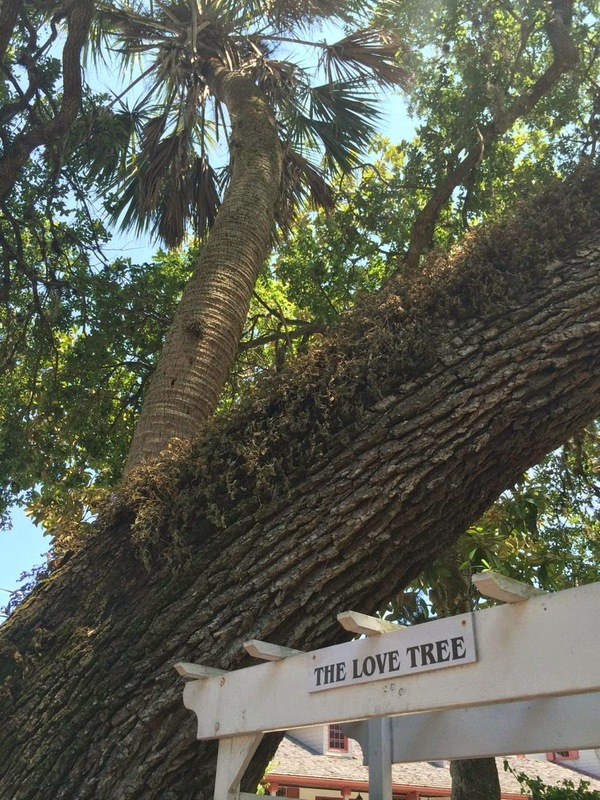 We counted several trees that had probably stood sentinel over the Spanish settlement for hundreds of years, but we saw nothing that we would call a Love Tree. What exactly does a love tree look like? A few minutes in 90+ degree temperatures with a dose of humidity thrown in for good measure, we'd pretty much decided a tree is a tree is a tree. At one point, I started to ask a gent with a long grey ponytail if he knew where the tree was. Since he was sitting on the steps of the house where the "Ghost Tour" began, and looked kind of grumpy, we decided to keep walking. Finally the heat got to us. We gave up our search, turned down an alley and headed for a coffee shop that promised cold iced tea. "You don't by any chance know where the love tree is?" I asked the barista. "Yes," she said as she pointed down the alley in the direction we had just come. The direction of the ghost tour man. "You can't miss it." Nice tree, but not the "Love Tree." Cold drinks in hand we braved the heat and headed back. There were still no signs of the tree we were hunting. We walked on, rounding a corner and walking through a parking lot. When we saw the sign that said "Love Tree Cafe" we had a sense of what Ponce de Leon must of felt like when he spied the fountain of youth. We stood under a rather large specimen of a tree and posed for a picture. There was nothing about this tree that spoke of love, but what the hey, we'd found it. Right? Wrong! We followed hand painted arrows around the side of the clapboard house. As we rounded yet another corner, we stopped in our tracks. There it was - the real love tree, right next to the stoop where the scary man had been sitting. This is the kind of mother/daughter story that makes for good laughs and not so good pictures. Even now, I feel a giggle working it's way up into a full on chuckle. We spent the rest of the afternoon sitting next to the hotel pool at a table covered by a bright umbrella, catching up with each others' lives. We talked of work and of play, of moving and of staying, of old friends and new, of things that come naturally after the ice has been broken. Stepping out of the moment, back into my head, I tried to take mental selfies. The bird sitting on the pool steps. The throat puffing lizard. The smile on my girl's face, her hat, her bright orange shirt, her polished nails, her earrings. That's when I figured out, you can't be in the moment and memorize the moment at the same time. The best memories, I guess, are engraved on the heart, not the brain. What's on your list of things to do this summer? Where will your magical journey take you? According to folklore, a man and woman loved each other dearly. To express their devotion, they planted two trees at the same time. The woman planted a palm tree, which was sturdy and able to withstand the most violent storms. The man planted an oak tree, representing flexibility and protection. Over time the oak tree wrapped around the palm, protecting it. I've been doing a lot of thinking lately, not so much writing. WHen I sit down to write, I have a hard time making sense of my "random thoughts." More than random, they are like a big ball of different colored rubberbands. You know how when you have too many rubberbands lying around, so you just start wrapping them around a tennis ball and before you know it you've got this gigantic ball of bands going this way and that. Sometimes I want to write about the blue one, down there under the green, behind the red, on top of the brown. It's hard to get to just the right thought. All the thoughts (rubberbands) are not necessarily connected but are intertwined enough that I have to be really in the mood to write, or I don't write at all. 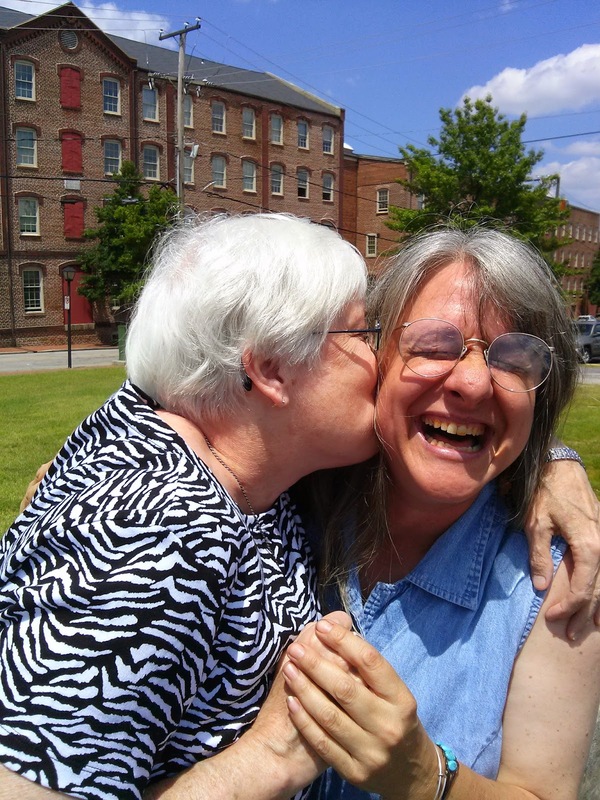 My writing coach, Carol O'Dell, told us in the very beginning of our group get togethers, that a) we are writers and b) even if we're not typing. I think Natalie Goldberg (Writing Down the Bones - Freeing the Writer Within) said something along the same lines, "you're a writer even when you don't write." So here I sit in a quiet room with little to disturb my thoughts or process. l Three month old Gavin is sound asleep in another room. I can hear a light rain outside, and the washing machine spinning. I'm ready to write. I want to write. But what should I write about? Yesterday I presented Sweetie with a new gas grill. The whole bottom of our last one, came off in his hand thanks to Florida rust causing weather. When I walked through the den I found Sweetie sitting in a circle of grill parts. All the screws, nuts and bolts were, in typical Sweetie fashion lined up by size in neat rows. I was going to get the hamburgers ready to cook, but could tell this process might take longer than expected. Almost 7 hours later, Sweetie was still at it. I would have thrown it all back in the box, but not my man who apparently likes a challenge. By the end of the day, after a storm passed over, Sweetie stood near his new grill, spatula in one hand, his other holding his aching back. Still he was a happy man. The point of telling you all that is to say, it might help me write if I put away my helter--skelter way of doing things and organized my thoughts. I think what I'm going to have to do is be more mindful of the subjects. Set aside more time for writing.
" In the middle of the world, make one positive step. In the center of chaos make one definitive act. What color rubberband are you trying to get? A few years ago, I was introduced to a friend of a friend. To paraphrase a much used saying, any friend of Terri's is a friend of mine. I haven't figured out yet about online friendships. It seems odd that relationships can grow and flourish when people have never met in person. Never having met … could it that be the reason online friends are friend? Because the obscurity of the Internet prevents people from getting to know the "real" person. But the opposite could be true also, don't you think? The fact that you many never meet an online friend may give you more freedom to be the "real" person you are without fear of judgement. From the start my friendship with Terri St. Cloud was special. A petite woman in a "woo woo" store told me about bonesigh arts. She also told me about Tibetan bell massages. She didn't steer me wrong in either case. Bella was the fairy's name. I call her that because after that day, she kind of disappeared, from me and Terri. I've wondered more than once if she was real, or if the whole experience was something I'd see on Touched by an Angel. Terri could be described the hub of my Internet relationships. Beautiful, creative, spiritual, funny, kind and caring women have touched my life like spokes of a wheel. Dani, Po, Star-bathed Sue, Susan, Akasa, Diane and Sorrow comprise for me a circle of women whom I can lean on and share with. Early on Sorrow and I became pen pals. Two souls who appreciate fine stationery, colored ink, and pretty stamps. Despite the ease of email, Sorrow and I immediately felt the kindred spirit that one gets from sharing thoughts on paper, then sending them off through the air (thanks to the postal service) knowing the person receiving them will anxiously rip open the envelope to let the words fly free. What's better than receiving a letter or card, smelling of lavender and filled with glitter? What's sweeter than holding that letter close to your chest inhaling, not just the smell but the warmth and spirit of the writer. Sorrow is a mother, daughter, teacher, potter, stained glass maker, quilter, painter, baker, writer, and photographer, to name a few. We are "Cohorts in Cahoots" making quilts for people who need to be reminded of how special they are. I await the day when I can a)walk the labyrinth in her back yard, b) eat some of her Christmas cookies, and c)watch as she magically turns wet clay into art. Until last month meeting Sorrow in person was at the top of that list. When Sweetie and I were planning our trip to VA for Robert's graduation, there two side trips I wanted to take. One to Maryland to meet Terri and the other to VA to meet Sorrow. As it turned out we could only do one. Sorrow picked a small bistro in Petersburg, VA almost equidistant from where I was staying. I needed to get home to prepare for a week of visitors, but I wasn't going to let anything, let alone 2 hours, keep me from meeting my Cohort. We followed the GPS into Petersburg which has been around since some of Virginia's earliest days. As we rounded a corner, there on the corner was a quaint gray building with while doors and shutters that looked out of place next to brick buildings that had seen better days. "Arriving at your destination," the man in the GPS repeated until we shut off the engine. But I already knew that, because I had barely stepped out of the car when a woman I'd never seen before but knew on a heart level was embracing me in what can only be called a bear hug. OMG. Talk, talk, talk as we made introductions and headed inside the restaurant. A quiet place with linen table clothes, glasses dripping with ice cold water, and a waiter standing by with menu suggestions. We ordered and we ate, but mostly talked for two hours. Patient as ever, Sweetie would wait for us to catch our collective breaths then pepper Sorrow with more questions. Although we'd never met before, I felt like I was having a reunion with someone I'd known forever. Did I mention Sorrow's huge smile and ready laugh? So there we were talking away, and suddenly I was moved to tears when John Denver's voice filled room. "You fill up my senses," he sang, "like a night in the forest, like the mountains in springtime, like a walk in the rain …….." Sitting at the table with my Sweetie and Sorrow engaged in conversation about bees, I felt my senses overflowing. Only the Great Music Director in the Sky could have picked a better soundtrack for this afternoon. Sorrow touched my shoulder, Sweetie nodded his understanding while I took it all in. Before we knew it, the clock neared the hour when we needed to get back on the road. We dragged our feet, but made our way across the street to say our goodbyes. Gift-filled goodbyes. Sorrow handed me a box full of handmade pottery, soap, and honey from her own bees. With an eye towards future projects I gave her a role of quilt batting. It does seem like the scales tipped in my favor, doesn't it? In my defense, a quilter can never have too much batting. I knew it needed a better home than the one I was providing in my dark must closet. Goodbyes are never easy for me. But as I learned from Robert (see post below) "saying goodbye makes saying hello again that much sweeter." I heard a Rabbi say once, that joy shared is doubled, sorrow shared is lessened. On a summer's day in June, I discovered that when Sorrow is accompanied by laughter, sharing, and hugging, only joy can come from it. If you want to know more about this fantastic woman I call friend, visit her blog at http://light4leaves.wordpress.com. I woke up this morning with thoughts of Dad dancing in my head. 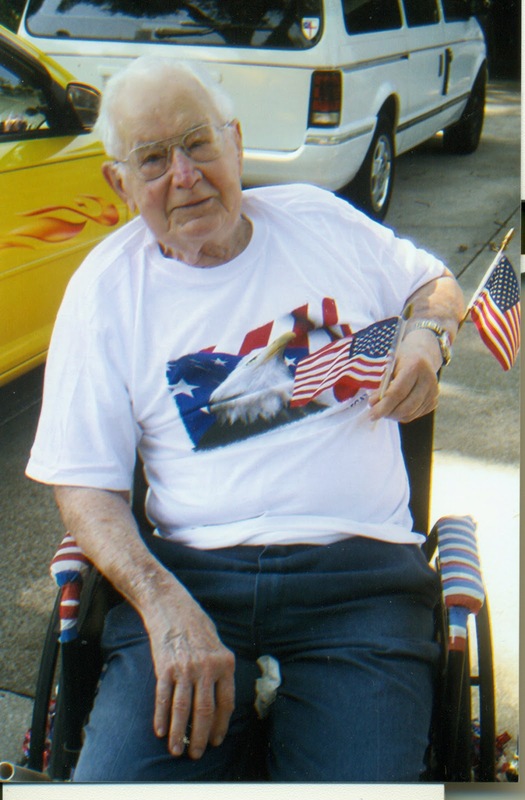 To be more precise with thoughts of Dad and the neighborhood 4th of July parade of a few years ago. I remember rushing Dad to get dressed, and how that rushing only slowed down the process. As the fire engine came up the hill, John Philip Sousa blared from a loud speaker. We managed to get Dad to a presentable state of dress and hurried him down the hall. He made it to the front stoop as the first parade dogs passed by. Seeing Dad, kind of wobbly on his walker, the fire engine stopped to make sure he didn't miss anything. The local politicians came across the yard to shake Dad's hand. He may not have been the oldest patriot in the neighborhood, but he was near the top. I know politicians shake hands for a living, but I saw more than politics. I saw respect in the eyes of the shakers. I saw pride and joy in the eyes of my Dad. He never failed to stand a little taller and a tad straighter when a flag passed by. I stood on the same stoop this morning. The parade consisted of a motorcycle, a fire engine, and about 25 people (kids and adults) dressed in patriotic garb - Uncle Sam hats, red, white and blue crepe paper streamers - with about as many dogs sporting bandannas. All of them waving and shouting greetings. I couldn't help it, I missed my father. "I know for certain that we never lose the people we love, even to death. They continue to participate in every act, thought and decision we make. Their love leaves an indelible imprint in our memories. We find comfort in knowing that our lives have been enriched by having shared their love." As I write this my mind travels to other 4th of July memories. A Drager family picnic in 1972. Uncle Jim's youngest brother dressed as Harpo Marx. The significance of which I cannot recollect. The first and only time I participated in a 5K run, in Coronado, CA Maybe it wasn't even that far. Probably it was more like 2K. Mostly I remember I thought it would never end, and a true "well what do you know, I made it" feeling. Attending the Prescott Rodeo in Arizona. Lying on our backs at Coronado Beach with fireworks electrifying the sky overhead. Somehow convincing Wendy to go with me to Balboa Park for an afternoon of John Philip Sousa music played by the Marine Band. Seeing the road less traveled up ahead and wondering which way to go. Falling in the creek while visiting Bluefield, VA with Laura and Robert. Planting flags on the graves at the Jacksonville National Cemetery. I watched some shows last night on the History Channel about the Revolutionary War. It's so hard for me to imagine how a small band of patriots defeated the whole British army. As pictures of battlefields littered with bodies flitted across the TV screen, I couldn't help but think of all the men and women who have laid down their lives for the same principles of liberty and freedom; the immigrants who continue to seek refuge in this country for a piece of that hard won freedom. I can only pray that the day will come when the birth rights of "life, liberty and the pursuit of happiness" belong to everyone regardless of race, religion, age, gender, sexual preference, or whatever else might separate the haves from the have nots. I hope no one was holding their breath waiting for my next post. I can't believe I lost all track of time and June flew by. Seeing the Belchers again was like walking in the back door after a long time away. All of us have aged some. Our bodies a little plumper, hair a little grayer. Six months cancer free, Laura looked happier than I've ever seen her. Long, tall Robert is not too demonstrative, but I got my hug, and several smiles. At one point I apologized for sharing so many baby photos and stories but I couldn't help it cause that's all I had. He said, I've grown up a lot since then!" Yes, I had to give him that. I learned to look at the world through the eyes of a curious little boy. I learned to stand still so others might have the joy of discovering ... a rock, or a pumpkin, or a statue. I learned the it’s only fair for everyone to help with a 10 second tidy. I learned, unless I wanted a kitchen full of “snow” not to turn my back on a small child and a bag of flour. I learned not to call you Bobby. I learned it was not a good idea for me to jump on the trampoline. I learned to listen for the sound of garbage trucks. I learned the importance of long showers, bubble baths and soft sheets. I learned there is no limit to the number of times one can watch “Swiss Family Robinson.” Mark of Zorro,” “Air Bud” and Dave Hood’s “Real Wheels - There Goes A .....” videos. I learned the land of make believe, where knights slay dragons and pirates bury their treasures, is quite real to a small boy with a big imagination. I learned that any day can be a pajama day. I learned that cowboy boots are an important fashion accessory even if they are three sizes too small. I learned even the smallest puddles make big splashes. I learned to touch snakes. I learned Florida’s scraggly pine trees do not make the best “cut your own” Christmas trees. I learned not to wear a hat at the beach on a windy day. I learned the way to drive a boy crazy is to insist on taking his picture on the first day of school. I learned to check the temperature of the water before putting a nekkid-assed baby in the tub. I learned that adoption doesn’t mean giving up, it means giving to. I learned I’ll never pass by a pumpkin patch, see a monster truck, eat Japanese food, or hear the theme from Cops without thinking of you. I learned that saying goodbye, makes saying hello again that much sweeter. Pretty incredible list, don't you think? I finally got to meet Robert's birth mother and his extended family. I'd told myself if the day ever came, I would express my gratitude. The last night in Virginia, I was able to look Chris in the eye and tell her how her decision to let the Belchers adopt Robert affected not only them but me. It was a gift. We'd had a not so great adoption story in my family so being a part of Robert's life, and seeing how adoptions can work was healing for me. It was a brave thing Chris did. I waited for 18 years to say thank you to Chris. I wanted to say it in person. Perhaps I should have written the words much earlier. I'm reminded that sometimes we carry thoughts around in our head waiting for the "right" time or place to say them, but for reasons beyond our control that time never comes. I was lucky. If you've got something important to say to someone important, don't wait.